Color in 3 dimensions. 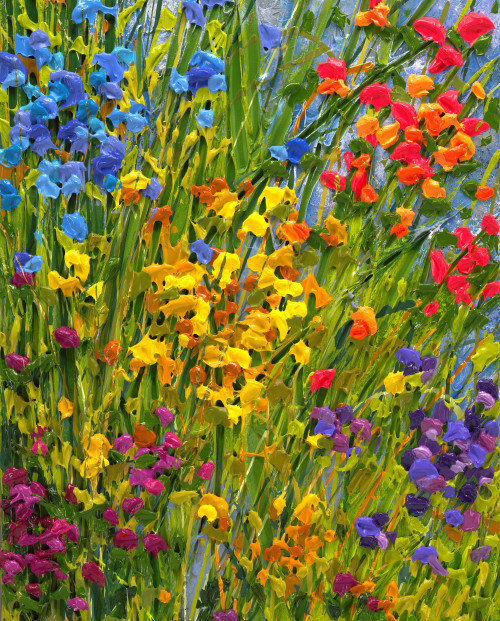 A beautiful and profound work by artist Jeff Hanson, "Day Trip to Nantucket" captures the beauty of vibrant and rich summer wildflowers. Nature's tapestry can be organized and messy in a way that instills awe and defies many from recreating it with such purposeful specificity. Jeff Hansen has done just that as his unique and tactile approach to painting creates depth that abounds with exuberant color. This is a puzzle that once complete one may never want to take apart. Make this puzzle a new fixture in your home, or on your wall to enjoy its beauty for years to come. This is a beautiful puzzle. However, it is one of the hardest I have ever put together. I did get it done in about 2 weeks. That is just working on it for 2 hours or so a day.